Fernando Alonso admits Ferrari's lack of competitiveness is "not good" after he and team-mate Kimi Raikkonen finished ninth and 10th in Bahrain. 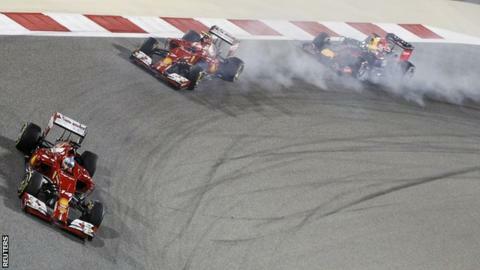 Ferrari's lack of traction, heavy tyre usage and poor straight-line speed were exposed at Sakhir. "We would like to have extra speed and to be able to battle with anyone," Alonso said. "But at the moment it seems we miss on that aspect. We have some strong points that some other circuits will show." Ferrari president Luca Di Montezemolo was in Bahrain for the race and admitted it was "painful" to see the team struggling so badly. "I don't like seeing Ferrari in this condition," he said. "The engine people at the factory need to work to make a big leap forward in quality. "I didn't expect much from this race, but I did expect a bit more than this. To see a Ferrari this slow on the straights is very painful." Despite the poor performance, Alonso slipped only one place to fourth in the drivers' standings. He is 35 points behind leader Nico Rosberg of Mercedes, who leads team-mate Lewis Hamilton by 11 points after the team dominated the first three races of the season. Alonso is two points behind Force India's Nico Hulkenberg, but insists he is still confident Ferrari can improve their car sufficiently to enable him to fight for the championship. "We have the resources, we have the potential, everything in our hands," said the Spaniard, who has finished second to Red Bull's Sebastian Vettel in three of the last four world championships, and who won the last of his two titles in 2006. "We believe we can do better than we are doing now. And the track is one of the worst [for the Ferrari car]. We are missing some of the characteristics this track requires. "In China [at the next race on 20 April] I expect to be more competitive. Barcelona, Monaco some circuits are coming where we need to get some podiums hopefully."